Epithelial ovarian cancer (EOC) is the most lethal gyncaecologica malignancy. The predominance of aggressive Type II tumours (comprised of high-grade serous, high-grade endometrioid, and undifferentiated carcinomas) that are characterised by nearly ubiquitous p53 mutations (> 96% of patients) and primary or acquired resistance to platinum-based chemotherapy is the reason for the high mortality rate. There is a pressing need for more effective, innovative treatment strategies to particularly improve survival in this major subgroup of EOC patients. The GANNET53 project aims to achieve this goal by applying a highly innovative treatment concept whose scientific rationale directly grew out from solid basic research findings by members of the GANNET53 consortium. Two CLINICAL TRIALS, i.e. the GANNET53 trial and the EUDARIO trial will apply a DRUG STRATEGY inhibiting the central chaperone Hsp90 (heat shock protein 90) in p53 mutant (mutp53) EOC. The GANNET53 Project has received funding from the European Union’s Seventh Framework Programme for research, technological development and demonstration under grant agreement no. 602602. Here you find more information about the CLINICAL TRIALS and TRANSLATIONAL RESEARCH. We established a highly efficient scientific consortium with a strong track record of proven capability and manpower to perform this multicentre clinical trial and assess our innovative therapeutic concept in this deadly disease. Our consortium consists of nation-wide clinical trial groups in gynaecological oncology and high-volume university centres as well as noted p53 scientists and 3 innovative SMEs. Since ovarian cancer is defined as a rare cancer, a scale at the European level is crucial for the planned clinical trial. Here you find more information about the GANNET53 Project Partners. Alterations in the p53 tumour suppressor gene, often called the Guardian of the Genome (citing Sir David Lane, co-discoverer of p53 in 1979, and member of our External Advisory Board) are the most common genetic alterations in human cancers. p53 mutations occur in >50% of all human cancers. In sharp contrast to all other tumor suppressor genes, which typically lose protein expression upon mutation, 85% of p53 mutations are missense mutations in the DNA-binding domain, and they frequently generate conformationally aberrant proteins (full-length ‘mutp53’). For the longest time, mutant p53 (mutp53) protein was considered a 'dead' protein that has lost its potent tumor suppressor function (Brown et al, Nat Rev Cancer 9:862-73, 2009; Vaseva and Moll, Biochem Biophys Acta 1787:414-20, 2009), and was just lying around as waste in the tumor cell. Recently however, new insights changed this concept and established that mutp53 acquires broad new oncogenic activity (gain-of function, GOF). Compelling new evidence from mutp53 knock-in (KI) mice carrying human hotspot mutations provide definitive genetic proof for GOF in vivo (Olive et al, Cell 119:847–60, 2004; Lang et al, Cell 119:861–72, 2004; Hanel et al, Cell Death & Diff 20:898-909, 2013): The knock-in mice show a broader tumour spectrum including adenocarcinomas, higher tumour bulk, grade and invasion, multiple tumour types per mouse, and newly gained metastatic ability compared to the traditionally used p53 null mice (knock-out) that mainly get T-lymphomas and never metastasise. Constitutive stabilisation is the hallmark of (full-length missense) mutp53 proteins in tumour cells and their aberrant accumulation is the prerequisite for exerting GOF. Most importantly, mutp53 cancers develop a strong dependency on high levels of mutp53 for survival (‘addiction’ to mutp53). This was recently proven with KI mice. As a consequence, acute withdrawal of mutp53 triggers strong spontaneous cytotoxicity, blocking invasion and metastasis and restoring chemotherapy-induced cell death in human cancer xenografts in vivo (Muller et al, Cell 139:1327–41, 2009; Li et al, Mol Canc Res 9:577–88, 2011; Bossi et al, Oncogene 25:304-9, 2006; Yan et al, Canc Res 68:6789-96, 200817-20). Due to their aberrant conformation mutp53 proteins depend on permanent folding support by the multi-component Hsp90 chaperone machinery (which in turn is constitutively activated in tumour but not in normal cells), and it is this stable interaction between mutp53 and Hsp90 that is largely responsible for mutp53 accumulation specifically in tumour cells (Figure 1; Li et al, Mol Cancer Res 9:577–88, 2011; Li et al, Cell Death & Diff 18:1904-13, 2011). Pharmacological inhibition of the machine’s core ATPase Hsp90 (such as by the highly potent second generation Hsp90 inhibitor Ganetespib) destroys the complex between Hsp90 and mutp53, thereby liberating mutp53 and inducing its degradation by MDM2 and CHIP E3 ubiquitin ligases. As a consequence, Hsp90 blockade shows preferential and strong cytotoxicity for mutp53 cancer cells in culture and in xenografts. In contrast, wtp53 or nullp53 cells show only minimal responses. Moreover, Hsp90 blockade - by virtue of depleting mutp53 - dramatically sensitises mutp53 cancer cells to chemotherapeutics. Thus, Hsp90 inhibition mediates effective destabilisation and degradation of mutp53 in human tumour cells, acutely withdrawing an oncoprotein these cells depend on for survival. This is strongly cytotoxic in mutp53 harbouring tumour cells. Given the advanced development of Hsp90 inhibitors, this new paradigm holds immediate strong translational potential for significantly improving outcome in mutp53-driven cancers such as type II EOC. Figure: Scientific principle of the GANNET53 trial (Li et al, Cell Death & Diff 18:1904-13, 2011; Li et al, Mol Cancer Res 9:577–88, 2011). Destabilisation of mutant p53 protein by inhibition of the Hsp90 chaperone causes subsequent degradation by MDM2 or CHIP E3 ligases: Stable complex formation with Hsp90 causes aberrant stabilisation of mutp53 in cancer cells. 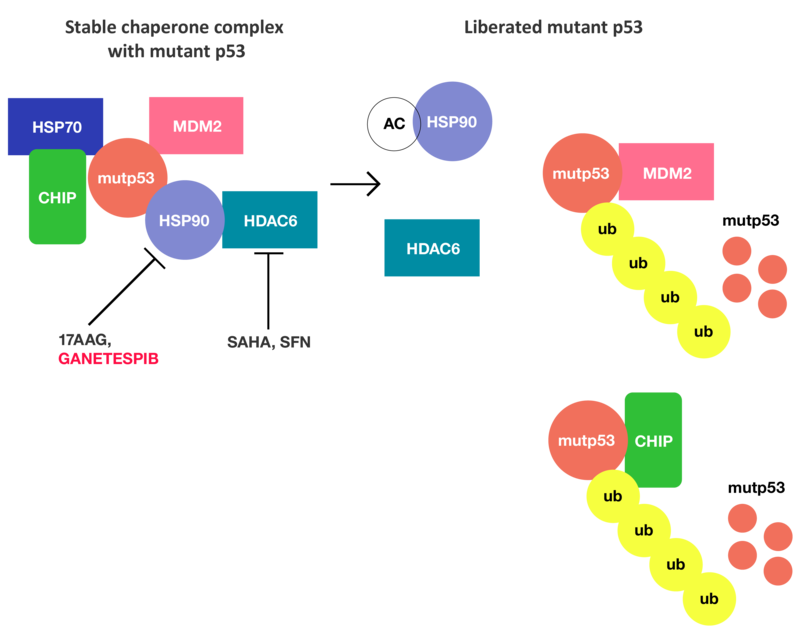 MDM2 and CHIP, which in principle are capable of degrading mutp53, are unable to degrade mutp53 as long as it is protected by the complex (‘caging’). Stabilised mutp53 exerts oncogenic gain-of-function (GOF). Acute depletion of mutp53 in tumour cells is strongly cytotoxic in all tested mutp53 solid cancer cell types tested (ovarian, breast, colon, and prostate). Small molecule inhibitors of the Hsp90 ATPase (such as the highly potent second generation Hsp90inhibitor Ganetespib, or the weaker first generation 17AAG + SAHA) acutely deplete mutp53, which is strongly cytotoxic in mutp53 harbouring tumour cells. Recent data from the EUROCARE database showed an age-standardised 5-year overall survival rate of EOC patients of only 36.1% (95% CI 35.4–36.8; Oberaigner et al, Acta Oncol 51:441-53, 2012). In Europe, 66,700 women are diagnosed with ovarian cancer and 41,900 die of the disease every year. This high mortality rate is due to the predominance of late-stage diagnoses, a high relapse rate after primary therapy and poor response of metastatic platinum-resistant tumours to salvage regimens. 70% of EOC patients present with metastasised disease at time of primary diagnosis (peritoneal carcinosis). The current standard of primary therapy is cytoreductive surgery and adjuvant chemotherapy with Carboplatin and Paclitaxel. Initial response rates are high, but inevitably the vast majority of patients will relapse in short time and ultimately die of the disease. Treatment strategy for recurrent ovarian cancer depends on the platinum-free interval, which is the time between the last platinum-based therapy and the detection of relapse. If the progression of the disease is more than 6 months after the last platinum-based therapy, the tumour is considered to be platinum-sensitive and can be retreated with Carboplatin in different combinations such as with Paclitaxel, Gemcitabine or pegylated liposomal Doxorubicine (PLD). Recent data on Poly(adenosine diphosphate-ribose) polymerase (PARP) inhibitor (PARPi) treatment have led to approval of Lynparza in the maintenance treatment of relapsed, platinum-sensitive epithelial ovarian, fallopian tube or primary peritoneal cancer with mutations in the BRCA1 or 2 genes in Europe (Puyade-Lauraine et al, Lancet Oncol 30469-2, 2017; Ledermann et al, Lancet Oncol 17:1579-2589, 2016). PARPi interfere with the repair mechanism of single strand DNA breaks, which allows DNA damage to progress and to result in double strand breaks. PARPi treatment of tumour cells with homologous recombination deficiency, for instance BRCA1/2 mutation, results in synthetic lethality. Furthermore, recently patients receiving Niraparib, a PARP1/2 inhibitor, as maintenance therapy, showed a significant longer progression free survival in the recently published NOVA study (Mirza et al, N Engl J Med 376: 2154-2164, 2016). This effect was independent of BRCA mutation status. A major treatment obstacle is the 25-30% of patients who are resistant to first-line platinum-based chemotherapy (Du Bois et al, Cancer 15: 1234-1244, 2009). By definition, they experience progressive or persistent disease during initial platinum-based therapy (primary platinum-refractory), or relapse of disease after less than 6 months after completion of first-line platinum-based therapy (primary platinum-resistant). Eventually all patients will become resistant to platinum after reiterative therapy with platinum-based regimens (secondary platinum-resistant disease). Treatment options are limited for platinum-resistant (Pt-R) patients. There is general consensus that secondary cytoreductive surgery is only indicated in select cases, where palliation of symptoms has priority (Schorgeet al, Oncology 25:928-34, 2011). No “standard” chemotherapy is currently available and systemic treatment is highly dependent on the physician’s choice. A number of cytotoxic agents including non-pegylated or pegylated liposomal Doxorubicin (PLD), Topotecan, Gemcitabine and alkylating agents such as Treosulphan or Cyclophosphamide have shown a relative modest anti-tumour activity as single agent. This is reflected by low response rates < 20% for each agent and only short-lasting remissions (Mutch et al, J Clin Oncol 25:2811-8, 2007; Gordon et al, J Clin Oncol 19:3312-22, 2001). However, Paclitaxel given as single agent on a weekly basis at a dose of 80-90 mg/m2/week, proved to be one of the most effective regimens in that desperate situation, with response rates in the range of 20-60% (Lortholary A et al, Ann Oncol 23:346-52, 2012; Richard et al, Nature Reviews Clinical Oncology 7:575-82, 2010). This efficacy is even seen in cases that exhibit resistance to paclitaxel administered via an ‘every-3-week’ schedule. It is noteworthy that the weekly schedule is by far less toxic. However, the progression-free interval may be short. The large subgroup of ovarian cancer patients with Pt-R EOC disease face particularly dismal survival rates with a median progression-free survival of 4 months and a median overall survival of only 14 months that did not improve in over 10 years (Markman et al, J Clin Oncol. 20(9):2365-9, 2002). In sum, there is a pressing need for truly innovative and more effective treatment strategies to improve the survival in ovarian cancer patients. The GANNET53 trial and the EUDARIO trial applies the safest, most effective and clinically most advanced Hsp90 (heat shock protein 90) inhibitor available. Ganetespib is a highly potent, 2nd generation Hsp90 inhibitor (synthetic small molecule) developed by Aldeyra Therapeutics (Lexington, MA, USA). Aldeyra agreed to provide the drug for this entire trial at no charge. Ganetespib has been studied in 5 completed Synta-sponsored clinical trials (studies 9090-02, 9090-03, 9090-04, 9090-05, and 9090-07) and 3 completed Synta-sponsored studies in normal healthy volunteers (9090-12, 9090-13, and 9090-15). Ganetespib is being studied in 6 ongoing Synta-sponsored clinical trials. Studies include: one phase I study, three phase II studies, one phase IIb study, and one phase III study. Ganetespib is also being studied in 17 investigator-sponsored clinical trials (ISTs), 8 of which are currently enrolling patients. The majority of ISTs are proof-of-concept studies across a variety of tumour types as well as haematologic malignancies. The ISTs currently enrolling include: two phase I/II studies, two phase I studies, and four phase II studies. Please refer to http://clinicaltrials.gov for further information.